Why are barriers and facilitators to knowledge use important? Researchers found that the cognitive factors most consistently associated with predicting health care professionals’ intentions and behaviours were beliefs about capabilities and intention. Their results led the authors to propose an integrated theoretical framework for the study of health care professionals’ behaviour and intentions, which is based on beliefs about capabilities. They hypothesized that in cases of non-volitional behaviour, beliefs about capabilities have the potential to directly influence both intentions and behaviour. In other words, among all of the existing socio-cognitive constructs, “barriers and facilitators to knowledge use” is one of the variables that best predicts both health care professionals’ behaviour and intentions. What are some of the conceptual models for assessing barriers and facilitators to knowledge use? In the context of barriers and facilitators to knowledge use in health care, relevant conceptual frameworks should help researchers move beyond conventional wisdom on the topic by identifying research questions, generating testable hypotheses, assessing outcomes with valid and reliable instruments, and making inferences from their study results. A useful framework would ensure that researchers can elaborate theory-based interventions with the potential for increasingly effective implementation of knowledge into clinical practice. Clinical Practice Guidelines Framework for Improvement – A framework based on an extensive search of the literature about barriers to physician adherence to clinical practice guidelines. It was designed to measure physicians’ knowledge, attitudes, and behaviour, and has also been utilized by researchers assessing barriers to knowledge use in specific clinical contexts. Promoting Action on Research Implementation in Health Services (PARiHS) – A framework that includes the three core elements of evidence, context, and facilitation with each positioned on a continuum from high to low. The proposition is that for implementation of evidence to be successful, there needs to be clarity about the type of evidence being used, the nature of the context, and the type of facilitation needed to ensure a successful change process. What are some methods and tools for assessing barriers and facilitators to knowledge use? To identify barriers and facilitators to knowledge use, researchers frequently use qualitative study methods, such as focus group interviews and workshop discussions. The identification of specific barriers and facilitators represents an approach for identifying the determinants of knowledge translation to practice and decision making. Based on the Clinical Practice Guidelines Framework for Improvement, a tool named Attitudes Regarding Practice Guidelines was developed to assess barriers to adherence to hand hygiene guidelines. The tool uses a 6-point Likert scale and contains two sections: attitudinal statements about practice guidelines in general and specific statements regarding the hand hygiene guideline. The authors concluded that their tool needed further testing and adapting if it were to measure potential barriers to adherence to clinical practice guidelines in general. Wensing and Grol reported the development of another instrument designed to assess barriers and facilitators to knowledge use. The Evidence Based Practice Attitude Scale (EBPAS) includes four domains: attitudes related to the appeal of an evidence-based practice (EBP), requirements to adopt an EBP, openness to innovation in general, and perceived divergence between current work processes and those required by an EBP. The BARRIERS scale was developed to assess barriers to research utilization based on four key dimensions: a) nurse, b) setting, c) research, and d) presentation. The scale is composed of 29 items and is comprised of four subscales that map onto the four key dimensions. The Alberta Context Tool (ACT) is an eight-dimension measure of organizational context for health care settings. The ACT has two versions with 5- and 6-point Likert responses for each item; the original version includes 76 items and a reduced version includes 56 items. The eight core context dimensions of the ACT include a) leadership, b) culture, c) evaluation, d) social capital, e) structural and electronic resources, f) formal interactions, g) informal interactions, and h) organizational slack. The Context Assessment Instrument (CAI) (LINK) identifies contextual indicators that enable or hinder person-centered continence care and management in rehabilitation settings for older people. The CAI contains 37 items with a 4-point Likert response format. A total score is calculated to represent an environment’s receptivity to change. The five domains of the CAI include a) collaborative practice, b) evidence-informed practice, c) respect for persons, d) practice boundaries, and e) evaluation. The Organizational Readiness to Change Assessment (ORCA) was developed for use in quality improvement activities to assess readiness. The ORCA contains 77 items with 5-point Likert responses for each item. The ORCA includes three domains: evidence, context, and facilitation. Assessing barriers and facilitators through direct input from knowledge users about their perceptions of the determinants of knowledge use is considered an integrated KT approach. This is because of the participatory nature of the exercise and the desire to understand and appreciate the knowledge users’ perspectives. Taking the process a step further may involve asking potential knowledge users to suggest interventions that they think might address the barriers and facilitators that they have identified. 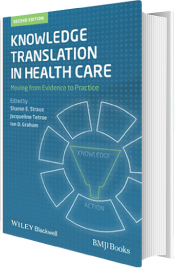 *For more information on barriers and facilitators, please refer to the full publication “Knowledge Translation in Health Care: Moving from Evidence into Practice” (2013).